Hacking in Hot Potatoes: A little knowledge brings a lot of power. A little knowledge brings a lot of power. As software developers, our job is to know the coding languages we use very well indeed. However, neither of us has any formal training in programming; everything we know was learned through reading, examining other people's code, and trial-and-error. Few working teachers have the time to do formal programming courses, and most would think that any kind of programming is therefore beyond them. In an effort to avoid what they perceive to be a difficult subject, many instructors fall back on WYSIWYG tools such as FrontPage and DreamWeaver to build their Websites, and become so heavily dependent on these tools that they're unable to manipulate any of their Web content unless they can figure out a way to do it using their editor. This dependency can be very counter-productive; it's possible to invest hundreds of hours in learning a complex program such as FrontPage, and still be frustrated by the inability to find a way to do a task that is very simple to someone who understands basic HTML. For these reasons, we have always tried to encourage users of Hot Potatoes to overcome their fear of code, and invest a little time in learning how HTML and CSS work. Even a very limited knowledge of the basics can give you a remarkable amount of power when it comes to customizing both ordinary Web pages and Hot Potatoes exercises. A quick job that produces what is needed, but not well. An incredibly good, and perhaps very time-consuming, piece of work that produces exactly what is needed. Make the exercise in JQuiz, and export it to create a Web page. Open the Web page in your WYSIWYG editor. Find the word Canada, and bold it. Not too onerous, but what happens if you need to make a change to your exercise in JQuiz later, to add a new question? You'll have to do the same process over again. If you're bolding some text in every question, you'll end up making dozens of changes over and over again, each time you need to edit the exercise. What is the capital of <b>Canada</b>? You can use a similar approach to perform a wide range of formatting tasks in your Hot Potatoes exercises, changing the style of text, fonts, and colours, adding superscript or subscript text, or inserting bulleted or numbered lists. Learning the code you need is very simple -- just work your way through an introductory tutorial such as the one at W3Schools (http://www.w3schools.com/html/default.asp), and start hacking. Hot Potatoes itself includes a set of keystroke shortcuts you can use to enter common HTML tags; for a list of these, check out the topic Keystroke shortcuts for HTML tags in the Hot Potatoes help file. It combines these files to create a single template for the exercise. It builds all the exercise data and configuration information into the template, to make a complete exercise page. It saves the page to disk. Each file contains a specific type of code that is used to create the exercise. The first file, hp6.cs_, is the one we're interested in. The meaning of the extension is roughly this: the cs_ file contains CSS (Cascading Stylesheet) code, which is used to control the style and appearance of the finished Web page. CSS files usually have a .css extension, but because this file is only a template, not a well-formed CSS file, it has an underscore at the end. The hp6.cs_ file is used by all the Hot Potatoes programs, and it contains all the CSS code used for the display of exercises. Before we edit the file, we will take one step that ensures that the changes we make will not be destructive; we're going to copy the file to a new location, so that the original file remains unchanged, and then we're going to tell JQuiz to look in the new location for our changed file. If we screw up, or want to abandon the changes, we can just tell JQuiz to go back to using the original file in the source folder, and no harm will be done. This is how we do it. 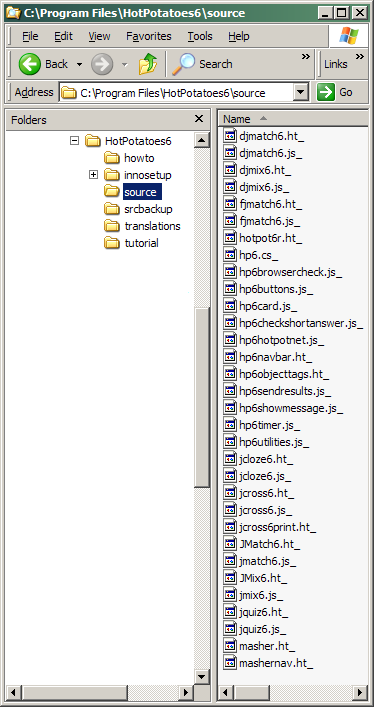 Create a new folder inside the Hot Potatoes folder called (for example) my_source. Copy and paste the hp6.cs_ file into that folder. Find and select your new folder. This tells JQuiz to look for source files in the new location first; if it finds a source file there, it will use it, but if it doesn't find it there, it will look in the default folder. Therefore, when we create our exercises, JQuiz will now use the version of hp6.cs_ in the new folder, but it will find the other source files it needs in the default location because they don't exist in the new folder. Note: When you've finished hacking around, and you want to tell JQuiz to stop looking in the new folder and use all the original source files, start JQuiz and press Control + Alt + Shift + T on your keyboard. So now we've made a copy of the CSS file, and told JQuiz to use the copy. It's time to start modifying the file. The modification we're going to make is one that a user recently asked about on our Hot Potatoes bulletin board. By default, when a student chooses an answer in JQuiz, he or she sees a little popup box with the feedback for that answer. The feedback is centred -- the convention for popup boxes in most computer systems is to have centred text, so that's what JQuiz does. However, if your feedback is long or complicated, it would be more appropriate to make the feedback text left-aligned like a regular paragraph. That's what we're going to do. If you do know CSS, this will be mostly familiar to you. The only unusual elements are the items in square brackets (such as [strFontFace]). These are placeholders , and they are replaced with appropriate values by the Hot Potatoes programs when they create their exercises. For example, if you specify Arial as your font in the JQuiz configuration screen, [strFontFace] will be replaced by Arial . You'll find that the basic ideas are simple; each block of code in the CSS file defines the way a particular HTML element or elements will be displayed. For example, the above code specifies that text inside a <p> (paragraph) tag will appear left-aligned, with a small font size, and no margin (zero pixels). Now try making a JQuiz exercise with a multiple-choice question, and click on one of the answers. The feedback should now be left-aligned in the popup window. Success! As you read through the hp6.cs_ file, you'll find that it's easy to guess what most of the settings refer to; we've tried to use descriptive identifiers such as FeedbackText or TimerText to make it easier for hackers to customize the settings. Nevertheless, you're still going to have to make some guesses and play around a little. That's how hacking works. These items at the beginning of the file are variables used by the page. As in the CSS file, items in square brackets are placeholders that will be replaced with proper values by JMatch. Here, two things are happening; the score is being calculated, and it's being displayed. The second operation has two variants, one of which is used when the answers are all correct (i.e. the exercise is finished), and the other one of which is used when the answer is only partially correct. That should do it. Now make a JMatch exercise and test it out! This kind of hacking is a great way to learn to code, too. To hack code written by someone else, you need to read and understand it first, then experiment with changing it. Every time you hack, you see how something is done, and eventually you'll build up a good grounding in whatever coding language you're using. However, you don't need to understand everything; you just need to understand the little bit of code that you're trying to change, and you can experiment to your heart's content without risk. If you do start hacking into the Hot Potatoes source files and you'd like some help or suggestions, post your questions, along with URLs of example exercises so that we can see what you're doing, on the Hot Potatoes bulletin board.